The DonJoy Arch Rival orthotic is designed to treat Subtle Cavus Foot by promoting natural foot function which includes improving stability, adding shock absorption, and alleviating pain. The recessed area under the 1st metatarsal head accommodates the plantar-flexed 1st ray and allows hindfoot eversion. The elevated heel works to cushion the heel and accommodate for tight calf musculature. 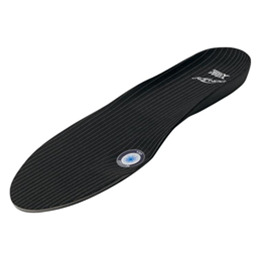 The Arch Rival orthotic is soft, comfortable and shock absorbent. Each pair is manufactured with X-Static Technology, which is proven to prevent blisters and odors. Available in seven (7) trimmable sizes that fit in most types of athletic and comfort walking shoes. Product Features…and the benefits you’ll experience! A proven anti-microbial, thermodynamic material that helps prevent blisters and odor. Cushions and accommodates excessive heel strike force and tight calf musculature. accommodates the plantar-flexed 1st ray and allows hindfoot eversion.